This was one I had been particularly looking forward to - for the Waved Albatrosses. Again, we had had an overnight cruise from Santa Cruz. After a particularly early breakfast [5:30 a.m.] we transferred to the pangas and made a dry landing at the small dock at Punta Suarez. 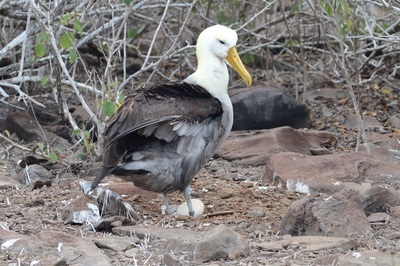 This gave access to a trail which effectively does a loop though the Albatross [and other birds] nesting area out to a cliff where one can watch the Albatrosses, Boobies, Frigatebirds and Tropicbirds flying by at eye level - a truly amazing experience. 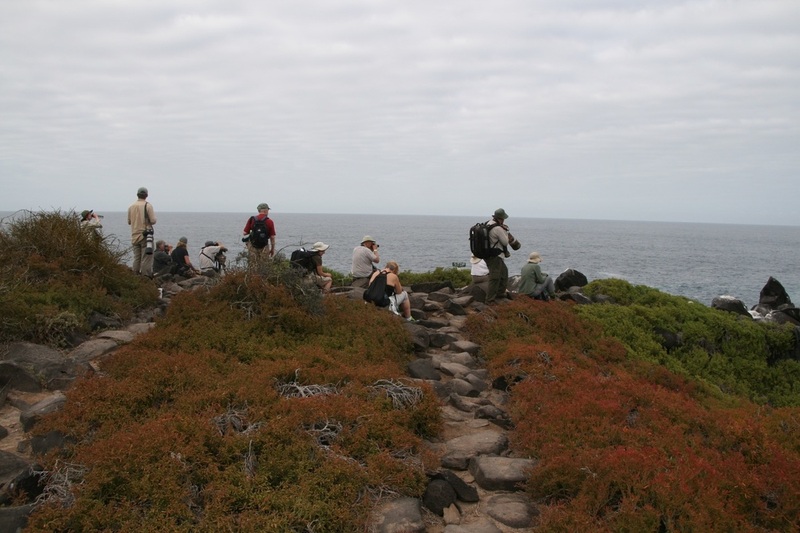 Espanola is the southernmost of the islands and also one of the oldest, so has relatively few obvious volcanic features, and is relatively flat with low scrubby vegetation consisting to a large extent of cacti and the endemic Scalesia bushes. The day itself was unfortunately rather a grey one so the light was rather flat - it would have been nice to have some sunshine for more dramatic photos. So, the first part of the trail soon had us in amongst the nesting and displaying Waved Albatrosses, which nest on the ground amongst the rocks, as shown in the header photo. We spent some time here watching their antics as the pairs 'fenced' with their bills, rattling them together face to face, sky pointing and uttering their strange wailing call, and strutting around with their heads going side-to-side in an almost Monty Python-like 'ministry of silly walks' fashion. Moving on, we soon found ourselves at the cliff on the other side of Punta Suarez, so we each found a suitable rock to sit on and prepared to rattle off 100's of photos of flying Albatrosses and the like. It was one of those situations where one could have sat there all day and still not be bored - the activity was continuous. 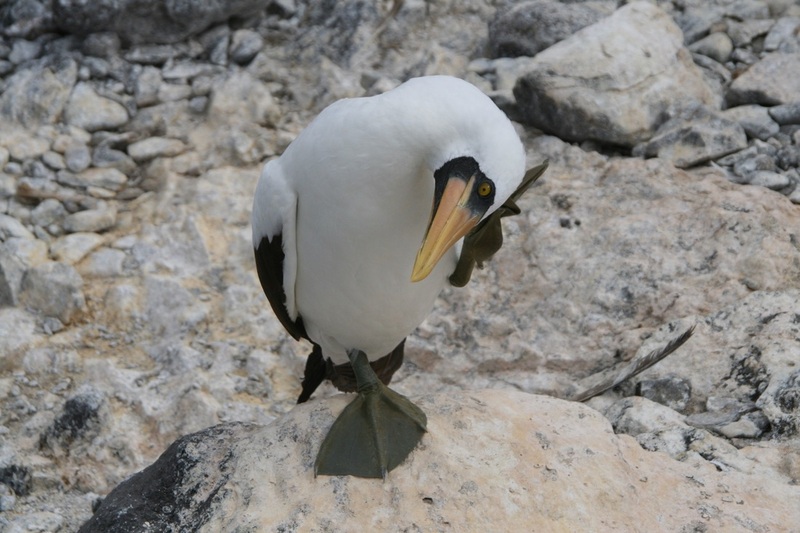 Occasionally an Albatross would appear from the nesting area, picking its way through the boulders in a kind of lumbering fashion, then finding a suitable spot to stand by the cliff edge with wings outstretched, waiting for a suitable updraft to take to the air. Whilst there we had a visit from an Espanola Mockingbird, which engaged itself in inspecting some of the photographic equipment that was lying around [see photo above right]! Whilst by the cliff we also had a few of the grey coloured Warbler Finches of the subspecies cinerescens at close distance, finding insects amongst the rocks. 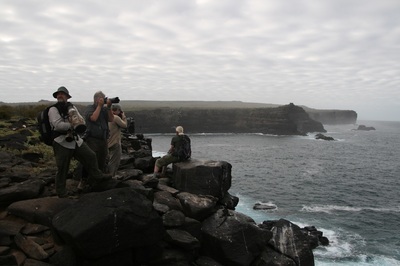 After a good long session here we moved farther along the cliff, continuing the loop, where we overlooked a natural blow hole in the lava down at sea level, and spent some time watching for the bigger waves to send a great plume of spray into the air as the wave entered the hole at the bottom. 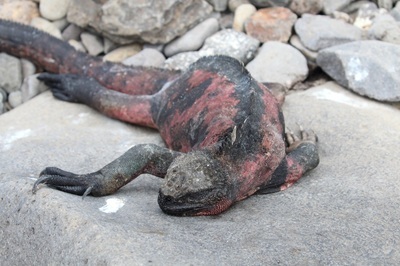 There were good numbers of Nazca Boobies here, and we noticed that the Marine Iguanas had a distinctive red colouration. Also along here was a Galapagos Hawk which was quite unconcerned by our presence, sitting on the cliff edge whilst we took photos from a couple of metres away. 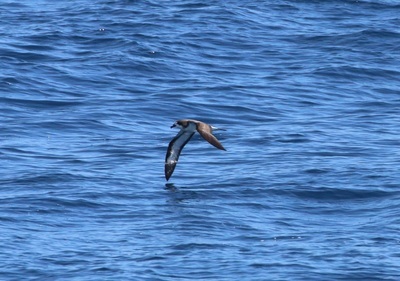 We also got excellent views of Swallow-tailed Gulls flying past just below us. We eventually made our way back to the panga pick-up point and thence back to the TipTop IV. As a footnote here some of my notes seem to indicate that we also moored at Gardner Bay which is some distance away from Punta Suarez. There is a wet landing there but only access to the beach as there is no trail. I can't recall whether we landed but will correct this when I receive the official trip report from Andy. 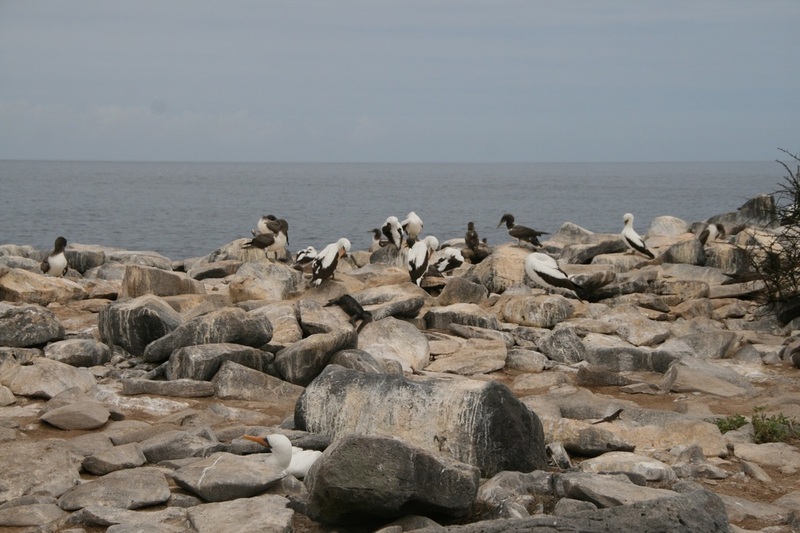 Once back on the TipTop IV we had lunch and then we set off for an afternoon cruise northwards passing to the east of San Cristobal island with a view to looking for cetaceans and any interesting sea birds. 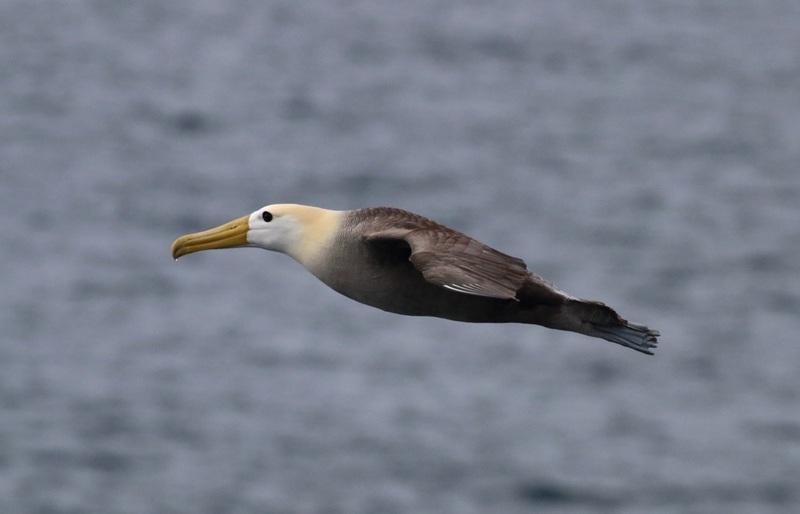 This had been agreed before with our Captain, hence the very early breakfast so we could set off in good time after watching the Albatrosses. This proved a good move. 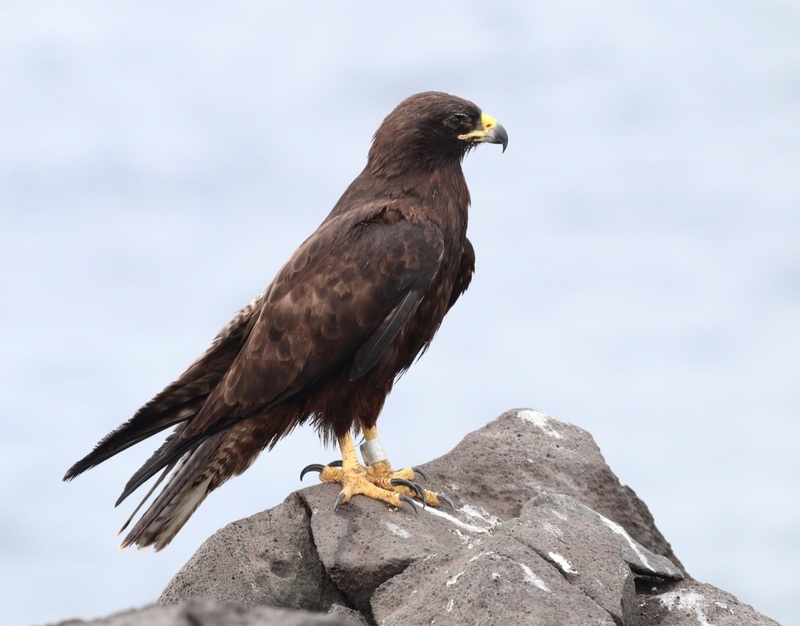 Among the sea birds were plenty of Galapagos Petrels giving good photo opportunities, and large rafts of Galapagos Shearwaters, and the ever attendant Elliot's and Wedge-rumped Storm-petrels. On the cetacean front we saw 20 or so Common Bottlenose Dolphins, including a pod which came to bow-ride our boat, 6 Short-beaked Common Dolphins, at least 10 Manta Rays which were seen when they jumped out of the water. 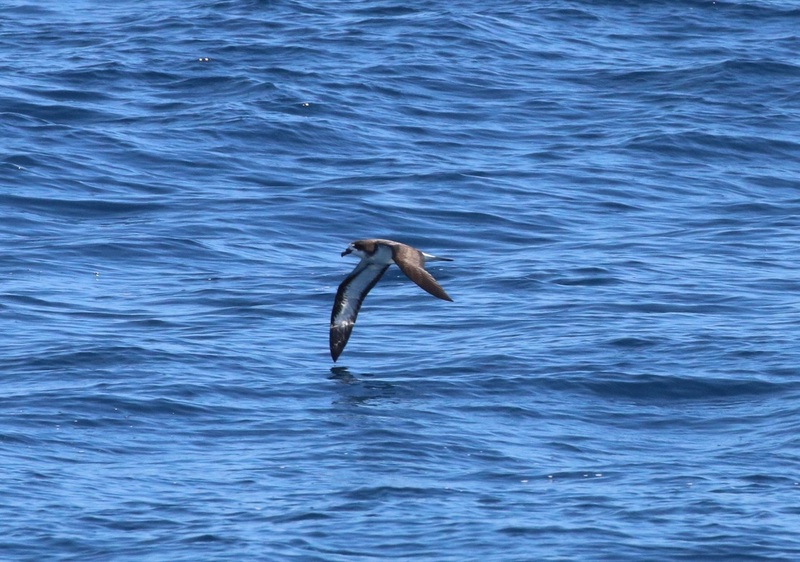 Most exciting was a huge vertical blow that I spotted off the starboard side of the boat. It was very distant but could only have been a Blue Whale, and as if to confirm its ID it eventually dived and showed the huge tail fluke which I think quick trigger finger Michael got a shot of. We also had what was most likely a Sei Whale. Eventually the light failed and we retired inside for dinner, briefing etc and bed. The navigation then continued overnight, with the next port of call being Punta Pitt on the NE corner of San Cristobal.